Since we’re entering Canada we had to go through customs. Normally it’s always the same story: you wait a while, you get to see a cranky customs officer, you answer their questions and you get your necessary stamp. But not when you’re in Canada! The lady at Pearson International Airport customs already showcased the friendliness of Canadians (and even making a joke!). “Are you traveling by yourself?” “No, together with the guy who was here before me” “Uhu, I thought so already” -insert winky face here-. The mood was set! We went to the ticket office at the airport to get train tickets into town (UP Express runs every 15 minutes and brings you to the heart of Toronto in 25 minutes). Again, the lady behind the desk was very friendly and she chatted like we go way back. She told us about the long layover return ticket for only 12 CAD; a cheap return ticket that expires within 7 hours. With this train ticket you also get various discounts for tourist attractions, such as the CN tower (worth mentioning: the train ride was incredibly comfortable -although we might have been slightly biased since it was our first time again in the ‘real world’). Right before the train reaches its final destination, it passes the Rogers centre: home to the Toronto Blue Jays. Next to the stadium, the CN tower is situated -both a communications tower and a tourist attraction these days. Here, you can absorb great city views, visit the 360° restaurant or enjoy a hands-free edge walk -it goes without saying that the latter is only for the true daredevils. For us, it’s time to get off the train and to get a taste of the city. To get the most out of our few hours in Canada, we had to make a stop at Tim Hortons. Of course, not because I was in desperate need of coffee but since my travel buddy was! This coffee shop is part of the Canadian culture and can be mostly compared to Starbucks or Dunkin’ Donuts. In my opinion, the ‘Tim Hortons-experience’ doesn’t come near the ‘Starbucks-experience’. Simply put, it misses the store atmospherics; it doesn’t feel as comfortable, it’s not as stylish and you just don’t get that special ‘Starbucks’ feeling (but hey, that’s just from a marketing perspective)! After having a coffee, it’s time to experience Toronto! Did you know it’s the largest city in Canada? Anyway… If you have been to New York City you’ll immediately get flashbacks. At first sight, the cities are so alike! People walking around in tailored fit suits (thinking of Harvey Specter yet? ), lots of yellow cabs and of course being surrounded by only tall buildings. Yet, somehow the Canadian look-a-like feels so much more relaxed! It’s less hectic, people aren’t in such a hurry and most of all they are very friendly (and incredibly chatty)! Even though we only had a handful of hours to spend in the city, we somehow ended up in Eaton shopping centre. Again, this might be due to the fact that we did a lot of sightseeing in Cuba and were just looking for some ‘normal’ things (such as eating a hamburger with fries and shopping). Besides, the Canadian dollar is very positive these days for Europeans -wink wink. Next to this beautiful and huge mall, the Old City Hall is situated and is being used as a court house nowadays. 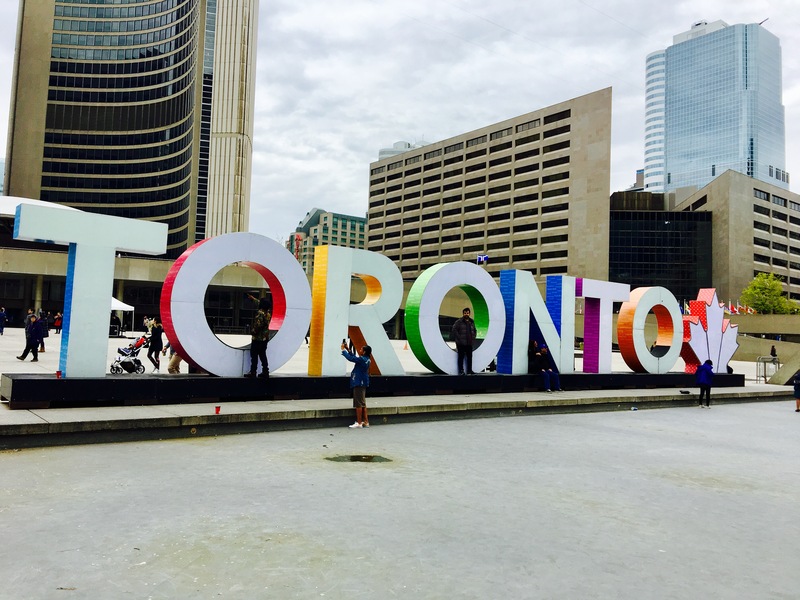 Around the corner you’ll see the Nathan Phillips Square including the very ‘original’ Toronto-letters sign. 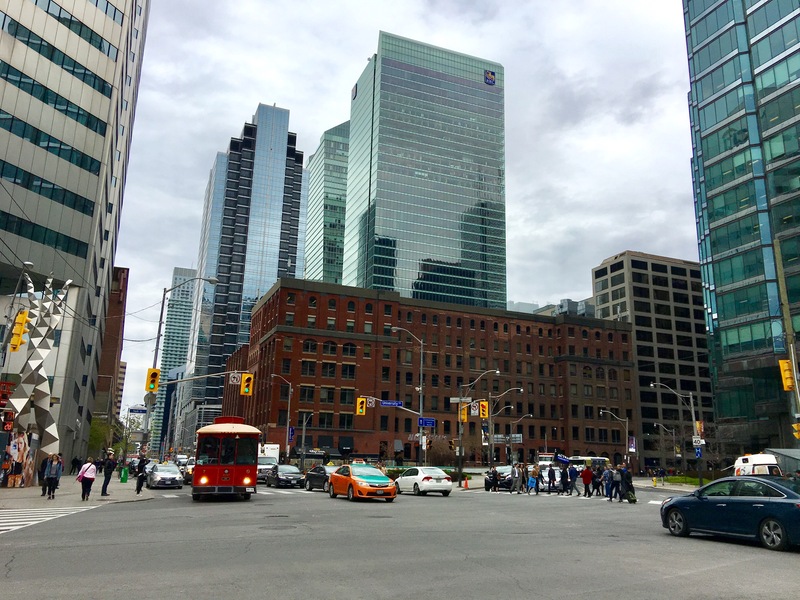 Besides experiencing the city life, there are plenty of nice things to do in Toronto: visit the St. Lawrence market, Distillery district, High Park and so on. Also, this year, Canada is celebrating its 150th birthday! Even more reason to visit this beautiful, diverse and hospitable country!